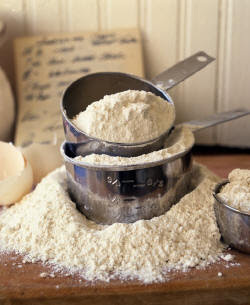 Food Lorists: What means: Bleached Flour? Labels: Questions on food Posted by Yann_Chef on at 6:20 p.m.
Unbleached flour has become a quite common description on baking recipes. Whether it is in cookery books or blogs, it always sounds healthier. Isn't it? So, what is the antagonist of unbleached flour made of and why is it, that bleached flour sounds like the bad guy of the baking world. First I will start to explain why, bleaching (whitning agent to be more precise) agent are used during the milling process of wheat flour. Experienced bakers will all, tell you the same thing: freshly milled flour makes a weak gluten, a slack dough and a dense loaf. In fact, wheat flour as to be aged, naturaly or chemicaly*, to allow the gluten development and improve its baking properties. The natural process of oxydation of the flour helps freeing the glutenin protein's end sulfur groups to react with each other and form even longer gluten chains that give the dough greater elasticity. The down side of this process is that the yellowish flour becomes progressively paler as the xanthophyll pigments are oxydized to a colorless form. The second explaination is of a cultural aspect. Our western society has become used to immaculate white bread. The demand of white bread has progressively overthrone the old traditional greyish, yellowish bread from my childhood. Now, once the phenomenon of the color changes in air aged flour was understood, millers started to use bleaching agents, "I'll give their little name later," to whiten flours. Then, our consumptions habits changing and the increase in the demand of white bread (in opposition the the old traditional bread) as made its use the norm. What are these bleaching agent? The first that was used is called azodicarbonamide. When it reacts with flour, it behaves as a hydrogen acceptor, and is quickly and completely converted to biurea, which is stable even during baking. The reaction occurs only during wetting of the dough. Acceptable doses for flour treatment range between 0-45 ppm. It is also used in the production of foamed plastics and the manufacture of gaskets. In the UK, the H.S.E has identified azodicarbonamide as a respiratory sensitiser (a possible cause of asthma) and determined that products should be labeled with "May cause sensitisation by inhalation." The use of azodicarbonamide as a food additive is banned in Australiaand in Europe. Organic peroxides: named benzoyl peroxide, it is a radical initiator. Homolytic cleavage of the weak oxygen-oxygen bond forms free radicals which trigger further reactions. It is also used in treatment of acne and in tooth whitening and hair dye. It is potential cancerogene and may act as a mutagen. It is also banned in Europe. Calcium peroxide: (CaO2) is a solid peroxide with a white or yellowish color. For all practical purposes calcium peroxide is insoluble in water but will dissolve in acid to form hydrogen peroxide . When in contact with water it will immediately begin to decompose releasing oxygen. In agriculture it is used as a fertilizer, and is also used in the presowing treatments of rice seeds. Also, calcium peroxide has found use in the aquaculture industry as it is used to oxygenate and disinfect water, and in the ecological restoration industry as it is used in the treatment of soils. It is banned in Europe as a food additive. Its E number is E930. Nitrogen dioxide: is the chemical coupound NO2. This reddish-brown gas has a characteristic sharp, biting odor. NO2 is one of the most prominent air pollutants and a poison by inhalation. It is banned in the EU and Australia. Chlorine dioxide: is a chemical compound of formula ClO2. This greenish-yellow gas crystallizes as orange crystals at −59 °C. As one of several oxides of chlorine, it is a potent and useful oxidizing agent used in water treatment and in bleaching. Chlorine dioxide is used primarily (>95%) for bleaching of wood pulp, but is also used for the bleaching of flour and for the disinfection of water. It is reported to produce diabetes-causing contaminant alloxan when reacting with the proteins contained in flour. You may have guessed it is banned in Europe and Australia. As you may have noticed chemical bleaching of flour is banned in the EU and Australia, there flour whitening and improving is done by adding some fava bean flour or soy flour. They act as flour improver as they fast forward the the gluten development as well as whitening wheat flour. * Chemicals used as flour improver. They are used mainly to speed up the development of the gluten. They are: Chlorine gas, bromate (banned since the 80's), Acid ascorbic (vitamin C) and anti caking agents. I listened to a very unique and intelligent radio station in orange county, ca.. Bleached foods may cause an unhealthy body system. I am not certain but I may of heard that such foods cause a slight stomach upset or bloated feeling..
if this is true please tell me what you have read/heard.. Interesting - you've explained why a recent batch of unbleached flour gave a rather flabby dough. It rose well enough, though, and the bread turned out OK, both as my normal white + 10% light rye loaf, and also in combination 50-50 with wholemeal rye in a sourdough loaf. I've recently changed my flour source, from UK mass-market (Dove's Farm), to straight from the mill (Shipton Mill), giving me access to some very interesting flours (emmer is currently yielding some very nice bread). So, do I stock up on Shipton's white flour, store it carefully and let it age? Or revert to Dove's Farm, with which, it has to be said, I was satisfied? Well the choice is yours. But if it was me I would go with the Shipton mill flours as it is local and guaranties you local high quality flour.